Kelly, Mary Theresa and Margaret Grenier. "Dancers of Damelahamid". The Canadian Encyclopedia, 30 May 2018, Historica Canada. https://www.thecanadianencyclopedia.ca/en/article/dancers-of-damelahamid. Accessed 20 April 2019. The Dancers of Damelahamid are a First Nations dance collective from the Northwest coast of British Columbia, traditional territories of the Gitksan nation. Damelahamid refers to the origins of the first ancestor, Hagbegwatku, and the land granted the Gitksan when their ancestors were placed on earth. It is a geographic location near Hazelton, BC, where the 'Ksan Historical Village and Museum is found. Based in Vancouver, Margaret Grenier is executive and artistic director, having assumed this role in 2003. 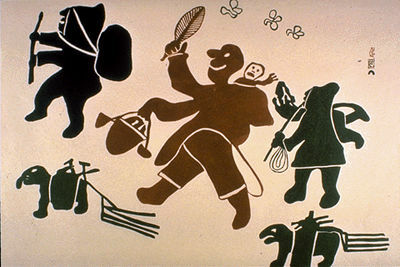 Grenier's parents, Ken and Margaret Harris, founded the dance group in the 1960s to restore their cultural traditions (see Gitksan). Ken Harris, elder and head Chief of the Royal Dakhumhast House, holds the rights to the traditional songs passed orally through generations within the House lineage. The stories, songs and dances are inherited with a chief's title, originating with the first ancestor who holds the title. They become the cultural property of that chief and with each generation, as significant events take place throughout history, additional stories become part of the chief's anthology. Each story takes place in a specific known location; therefore the right to a story also signifies the right to a geographical location and political ties. A House is a matrilineal line, or family unit, and all the Damelahamid dancers belong to the Dakhumhast House, considered royal, because its lineage is connected to the original ancestor and title of Hagbegwatku. The Dancers of Damelahamid perform dances and songs, many thousands of years old, to ensure that their adwaak or history is remembered, to maintain First Nations identity, and to express their spiritual connection with ancestral knowledge. The transmission of this cultural knowledge was interrupted during the first half of the 20th century due to the potlatch ban in Canada. As part of the cultural restoration process, Grenier relied upon a reel-to-reel recording that her grandmother, Irene Harris, and great-uncle, Arthur McDames, produced using pots and pans in place of traditional drums. After the ban was lifted, Grenier's mother purchased a drum for the family from a collector. The first performance outside a feast hall took place in July 1967 at Prince Rupert, at the first Ha Yaw Hawni Naw Salmon Festival, also known as "Indian Days." The group performed under the name Kaien Island Dancers. In 1970, the group danced for the visit of Queen Elizabeth to Prince Rupert during BC's provincial centennial celebrations. The salmon festival continues today as the We yah hani nah Coastal First Nations Dance Festival in Vancouver. 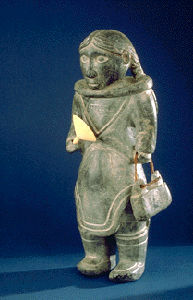 In 1991 the Dancers of Damelahamid collaborated with the Karen Jamieson Company, performing Gawaii Ganii at the UBC Museum of Anthropology and touring the work in Japan and northwestern BC. This developed into the Stone Soup tour presented at the Museum of Civilization (now Canadian Museum of History) in Ottawa and Place des Arts in Montréal. In 2004, under Grenier's direction, the first theatre performance took place at Vancouver's Scotiabank Dance Centre. Koelhz se mos, or Setting the Path, is based on the story of a one-horned goat and reflects the idea of linking ancestors with future descendants. In Gitksan culture, the path refers to the responsibility of the current generation to pass on the traditions to the younger generations. In 2007, Grenier selected seven songs from their archives to create Gilo Hyte: Sharing the Spirit, a work that appeared at the Shadbolt Centre for the Arts in Burnaby, BC, and toured to New Zealand and the Cook Islands in 2008. The exceptionally beautiful dance regalia is always made in the colours black, red and white, based on Indigenous pigments from alder bark and ochre. The drums include the box drum, a large rectangular cedar box, or hand-held skin drums. The dancers aim to make the performance a healing space in which audiences confront their notions about First Nations people and culture. 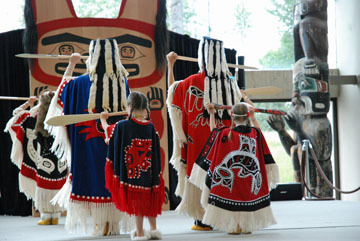 In 2010 the Coastal First Nations Dance Festival took place in North Vancouver and the Dancers of Damelahamid performed as part of the 2010 Cultural Olympiad at the Squamish Lil'wat Cultural Centre in Whistler, BC. 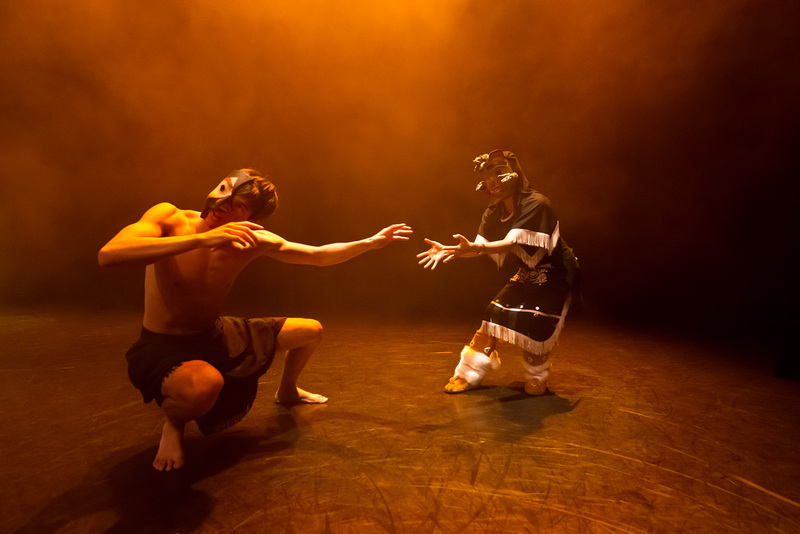 In June 2013, the dance troupe premiered Spirit Transforming, a full-length production that has since toured in Toronto and various cities in British Columbia. Premiering in May 2016, the Dancers of Damelahamid presented Flicker, a performance that combines dance with multi-media technology. Byron Dueck, Musical Intimacies and Indigenous Imaginaries: Aboriginal Music and Dance in Public Performance (2013). Matthew Krystal, Indigenous Dance and Dancing Indian: Contested Representation in the Global Era (2011).